So I’m going on my FIRST tour this coming March with the homie’s Mega Ran and Storyville (Soul Veggies) and the first show is going to take place in none other than the birthplace of hip hop…or an almost adjacent borough, anyways. 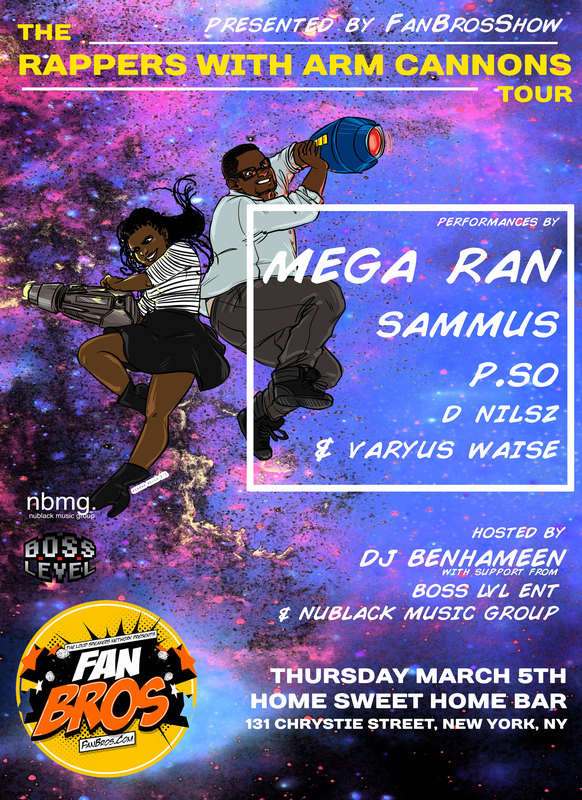 That’s right the tour is going to kick-off on the evening of Thursday March 5th at Home Sweet Home Bar (131 Chrystie Street) with sponsorship from none other than the FanBrosShow (the home of the urban geek). Supporting acts will include P.SO, with whom I’ve collaborated before, my NBMG labelmate D Nilsz, and Varyus Waise, the Boss LVL ENT dude who helped to put together my Halloween set. Suffice it to say, YOU DO NOT WANT TO MISS THIS. And if you DO (miss this), and you live in NYC, consider yourself dead to me. Oh yeah, and don’t forget to RSVP on Facebook.